Tester’s Corner: Onikakushi Ed. Vol 2. In both its visual novel and anime incarnations, Higurashi When They Cry, also known as Higurashi no Naku Koro ni, is revered as one of the greatest horror/mystery works of their mediums. If I liked the anime, will I like the visual novel? Definitely, without question. The anime is a great adaptation in two ways. First, it does not cut out or distort many important plot points, although there are certainly changes. Second, it makes fantastic use of the advantages of the animated medium to create suspense. The visual novel, however, explains several key plot points better than the anime does. 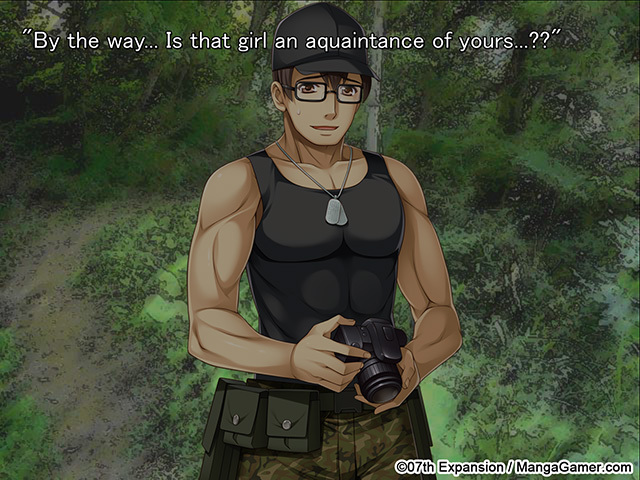 Most importantly, the visual novel portrays paranoia and confusion far better than anime ever could. The visual novel really gets you thinking like the protagonist thinks, whereas the anime just has you experiencing what the protagonist experiences. Chapter 1, Onikakushi, covers the first four episodes of the anime. Two main things set Higurashi apart from otherwise similar horror titles. Higurashi in its entirety isn’t just a story about how bad things happen and a bunch of people die. At its core, it is a story about overcoming adversity (although the first chapter is very much about bad things happening). 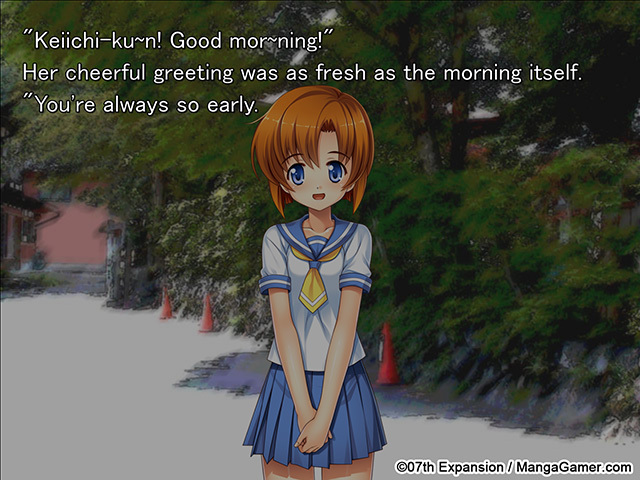 Higurashi‘s early slice of life scenes reinforce this overarching positive theme. They depict a group of friends who participate in cutthroat competitions on a daily basis. They struggle and play dirty to improve themselves and each other. It’s very much not your usual slice of life. 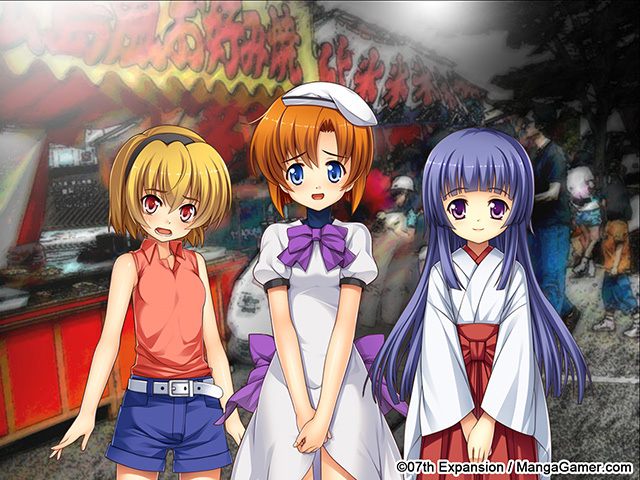 Paranoia plays a huge role in the first few chapters of Higurashi. Many characters deeply involved in the series of murders have yet to be revealed. Two main characters have yet to be introduced. The protagonist, and by extension the reader, doesn’t know why or even what is happening. In this way, Higurashi is quite similar to the visual novel Chaos;Head (excuse me, ChäoS;HEAd)—an unreliable protagonist tries to survive and figure out what the hell is going on. You could say that Higurashi is to horror visual novels as Amnesia: The Dark Descent is to horror video games. Higurashi is phenomenal bang for your buck in terms of both quality and quantity. It is very much enjoyable as a standalone work, but also leads into a greater overarching story. What are you waiting for? agreed all the way! But waiting for available money and time to play (dang legal bar exam) manga gamer doesn’t need a US copywrite lawyer do they?